FORGET ME NOT - PRISM BAND. 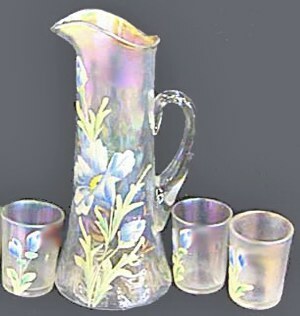 Tankard brought $350, the tumbler-$85 at the HOACGA Convention auction by Seeck, in April 2005. 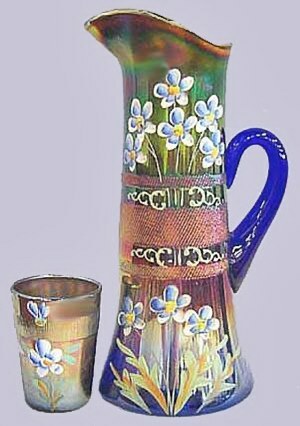 FORGET-ME-NOT Tumblers: (In the words of Bob Smith - May 26, 2006). 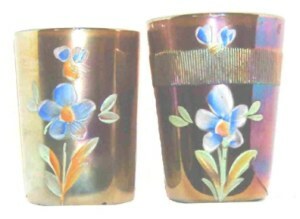 Four blue enameled Forget-Me-Not tumblers came up for sale on eBay. Every single previous Forget-Me-Not ever found all had Prism Bands. There are no Prism Bands on these tumblers. Now for the provenance. These tumblers come from the estate of John “Honey” Fitzgerald; Mayor of Boston 1904 -1914; father of Rose Kennedy who of course was mother of President Kennedy. The dealer was selling them for some descendents of “Honey Fitz” who lived close by here in the little town of LaConner, Washington which has 444 residents. Rose Kennedy had two brothers and two sisters and I checked the internet White Pages and there are three Fitzgeralds in the town, which most probably means they are great grandchildren of “Honey Fitz”. We finally have a presidential connection to some carnival glass; tenuous, but a connection. 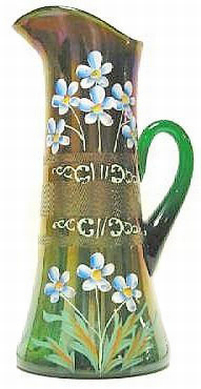 The original Forget-Me-Nots with Prism Bands were made by Fenton. We are not sure if Fenton made these because they are slightly shorter and are not ribbed inside, but they do have the same coloration and the same enameled pattern. 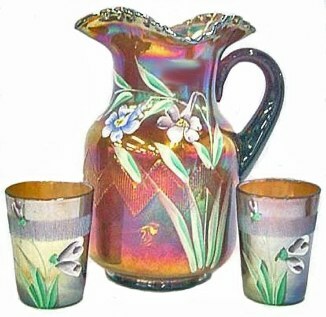 FORGET-ME-NOT Tankards/Tumblers: Amethyst, and Ice Green are additional colors known in these decorated sets. The basic design is called Prism Band. The hand painted water sets lend an entirely different perspective to collecting that shape. We have seen displays at conventions made up entirely of decorated sets, such as seen here. They are extremely attractive when grouped together. 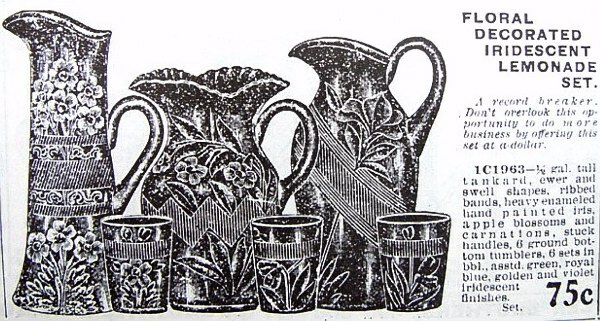 1911 and 1912 Butler Brothers Wholesale Catalog Ads: Display these highly desirable water/tankard sets at the height of fashion. We see Forget-Me-Not, Dianthus, Shasta Daisy, Iris, Columbine and Apple Blossom represented. Persian Pearl is a name Fenton used to describe their pastels; white in particular. 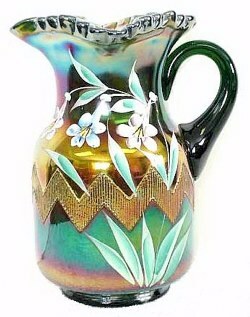 Many of the painted sets are found in white and ice green base glasss. COLUMBINE: These pitchers are frequently found. Amethyst/purple, marigold, blue and green are the usual colors. It is good to remember that hand-painting indicates personal preferences utilized by each member of the large group of painters employed by Fenton. Even today, as one tours through the department where these women work, differences in application and stroke, creates individuality. Therefore slight variations in every example will be noted. White ZIG-ZAG with SHASA DAISY Enameling. Tumbler is 4 in. high. 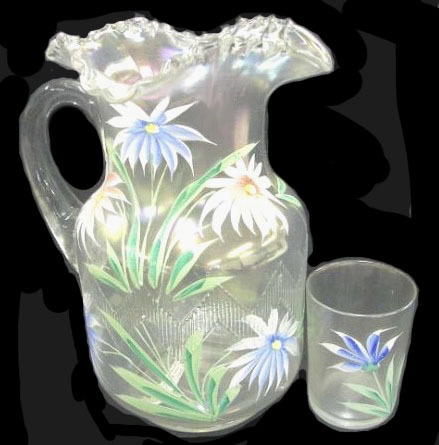 SHASTA DAISY: The daisy design is painted on a basic ZIG-ZAG pitcher. They can be found in marigold, ice green and white. 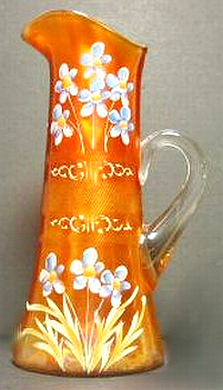 A vaseline Shasta Daisy tumbler is listed in a 2003 auction. Perhaps someone placed it under a black light for “glow”. 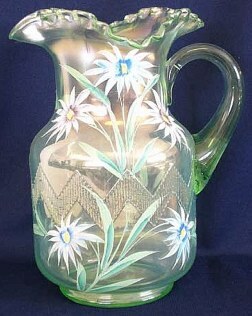 SHASTA DAISY on Ice Green ZIG ZAG Pitcher sold for $300 in mid April 2005. DIANTHUS: These sets are not plentiful. The painted design commands attention and sometimes have metallic trim around the opening. Base glass can be white or ice green. The basic design before painting is Prism Band, as found on Forget-Me-Not sets. And there be no herd in the stall ----yet I will rejoice in the Lord, I will joy in the God of my salvation. God tries our faith so that we may try His faithfulness. For the believer, inner peace and trust in God can thrive even in the worst situation. This is possible because of the never-changing character of a loving and sovereign God.